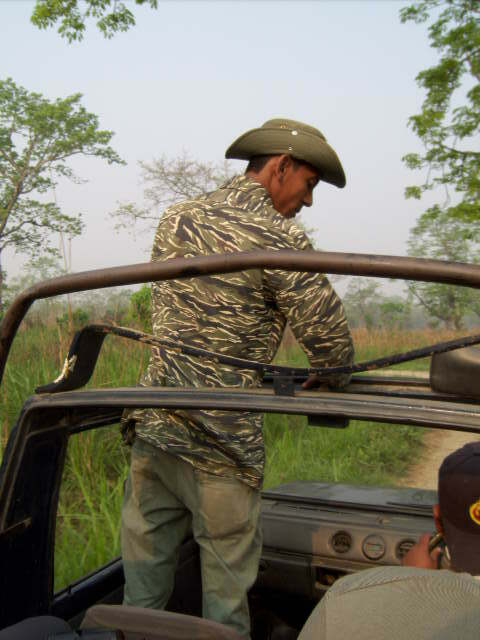 Our big adventure for this part of the trip was to go out into the jungle on a jeep. I’d been warned that the safari part of this was limited. There are animals there, but its not like Africa with an abundance of wildlife. So we took the adventure as a jungle trip, rather than a safari, as the experience of just being out there in nature is a special one. 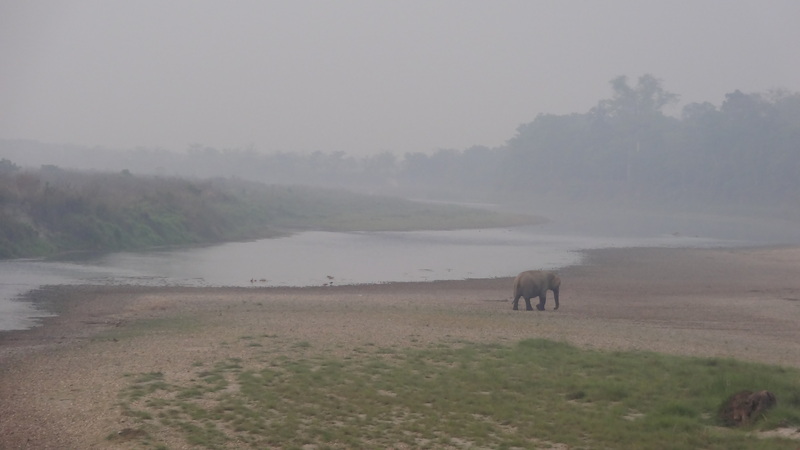 So first thing in the misty morning, as the first part of our adventure, we headed down to the Rapti river, which forms the boundary of Chitwan National Park. 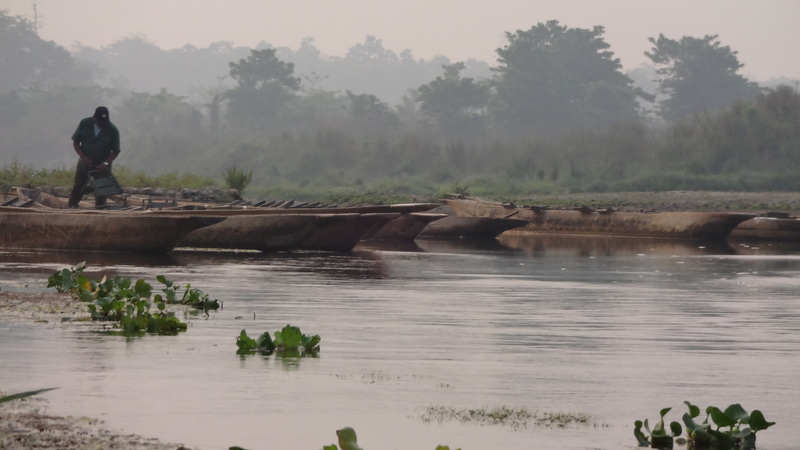 Its shallow and fast, and the only way to get across and stay dry (sort of) is by hollowed-out canoes. These are less than stable…I really thought I was going in! Later peacocks kept showing up everywhere. It was mating season, and the males were strutting around. By the end of the day, we were saying “oh that’s just a peacock” and recognizing their cries. Hard to believe that we got used to such a spectacular bird, so they seemed common like pigeons! As it got warmer, the mist lifted and the terrain changed. I loved how different areas of the jungle had their own feel. 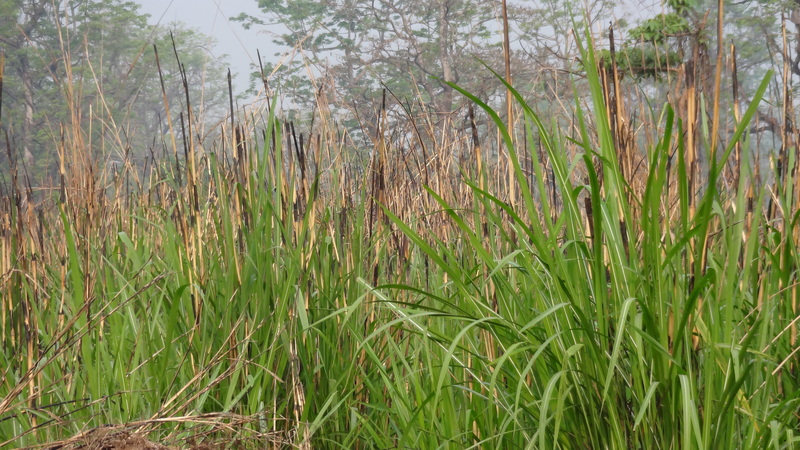 My favourite was the open grasslands and the cotton silk trees: the beautiful reed-like grasses and the angular, vaguely oriental feel of the trees were stunning. Add to this the imagination of what may be hiding in the grasses, and our eyes were set ahead, frantically scanning the view. We stopped at one of several viewing platforms to take a breakfast break. 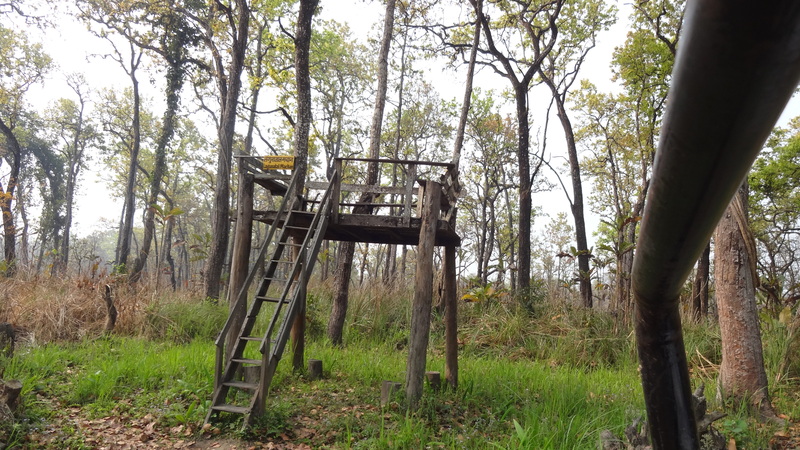 The rickety platform did give us more elevation to see around, but unfortunately no animals interrupted our meal. Our rickety viewing platform. Note missing step! 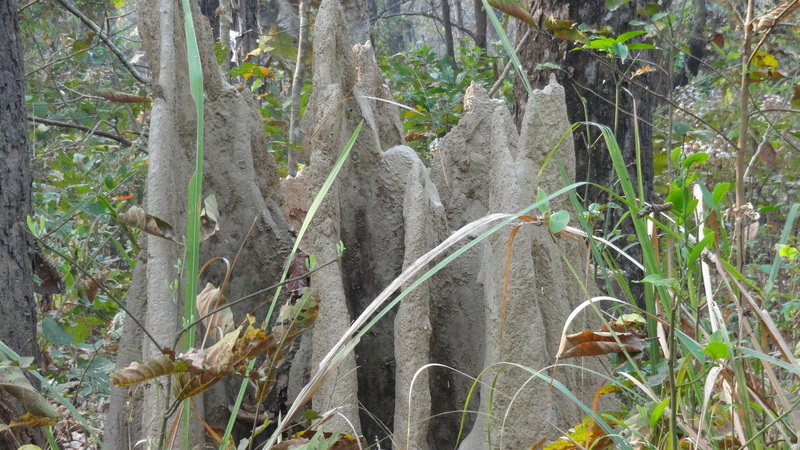 Termite nest. Apparently these make tasty treats for sloth bears. 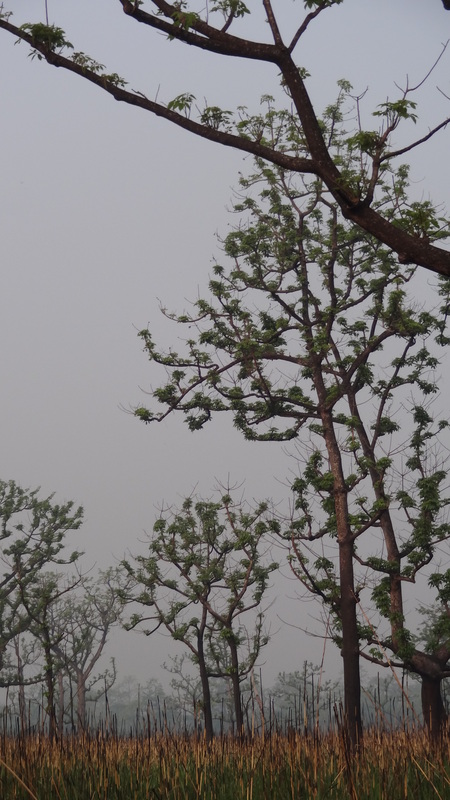 You could see claw mark-scratched holes around some of them…made by sloth bears looking for a snack. So what did we see that day? No tigers, unfortunately. They are now considered the prime wildlife sighting because they are so rare. There’s only about 200 Bengal tigers left in the park. But, fortunately, there’s now a concerted effort to stop poaching and track the surviving tigers. Hopefully, their numbers will slowly start to increase. 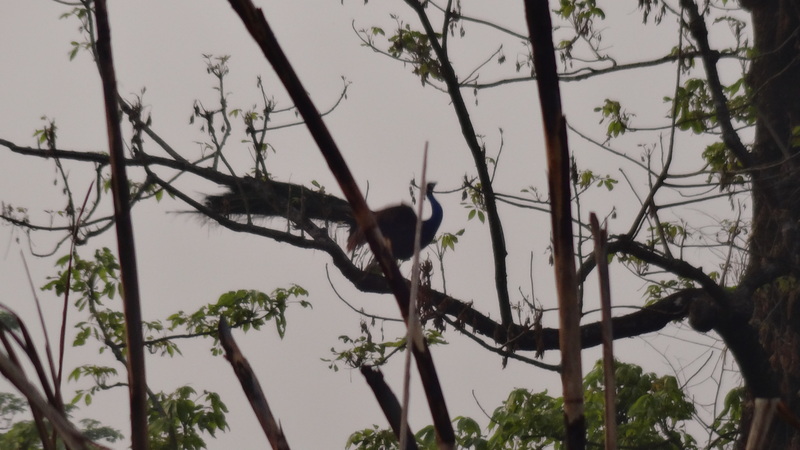 We saw lots of beautiful birds, countless peacocks, monkeys, deer, boars, alligators, cranes and wild ducks, a rhino and — most significantly of all — a black sloth bear. A large, male actually. 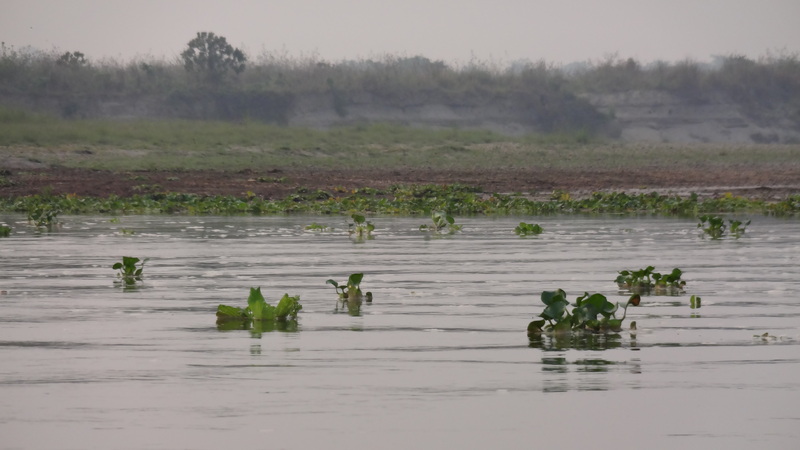 They are considered the most dangerous and unpredictable of all wildlife in Chitwan. He was actually frightened by us and ran along the horizon, trying to find a way to cross our path. He finally darted across our trail, but too fast for me to catch a shot. Maybe next time. ← Love, Love, Love the Baby Elephants!